Like the exterior, the interior of the Fiat Linea is an advanced expression of Italian styling, thanks to the quality of the material and the great care that went into the detail. The lines that run inside the passenger compartment are harmonious and well balanced with the external lines, which combine with the generous glazing to create a friendly, light-filled environment that guarantees excellent interior roominess, and more comfort than you might expect from a conventional 3-box saloon in terms of ergonomics and space for the driver and passengers. On a car, ‘comfort’ means a light, luminous environment that guarantees both good control of the road for those in the front, and perfect visibility for those in the rear. The concept of comfort also means being seated with plenty of space around you, in a comfortable, quiet place. And ‘well-being on board’ means having room to move around, but also finding everything where you want it, being able to get in and out easily and simply, and once you are seated, being surrounded by an airy environment; it also means enjoying good external visibility, enhanced by the generous size of the wing mirrors. The Fiat Linea was born ‘for’ and ‘around’ the individual; it is welcoming and practical, a car in which to experience moments of relaxation and comfortable journeys, enjoying perceptible far-reaching well-being on board. To achieve these goals, from the start of the project the engineers adopted the latest ergonomic criteria to define the parameters that measure a car’s ability to meet the demands of well-being and comfort onboard. The end result is the excellent values that the Fiat Linea achieves in basic ergonomic functions such as roominess, driving posture, access, visibility and the adaptability of the space available. These characteristics have always been winning qualities, and they are even more important today, because we spend more time in our cars, we are becoming more accustomed to cars from higher segments (which are therefore roomier), and the average height of the population is increasing. 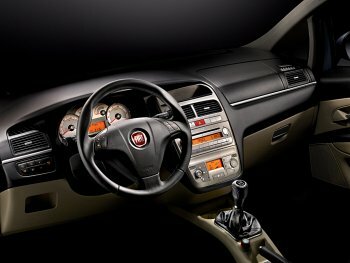 This is why the Fiat Linea has designed comfortable seating for people of all shapes and sizes. For example, at the front, the combination of a driver’s seat that can be raised and a steering wheel that adjusts for height and reach, produces excellent values of roominess as well as an ideal driving position (accommodating drivers from 1.50 to about 2 metres tall). Even if the driver himself is tall, there is still room for an equally tall passenger to sit comfortably behind him. And this does not detract from the luggage capacity which is 500 litres in the normal configuration. This is one of the most capacious in its category. And if the space is still not sufficient, the rear seat will fold down to create an enormous loading area measuring 1175 litres up to the ceiling. Driving is made particularly enjoyable by the position of the pedals, the steering wheel alignment, the position of the armrest and footrest, the excellent manoeuvring of the gearshift and the perfect visibility of the instrumentation and the main controls. The instrument panel designed by Magneti Marelli has a clear family feeling with the latest Fiat models, with large, clearly visible characters, while the graphics of the instrumentation make the information easily and immediately legible. At night, the orange illumination allows the pupil to focus more rapidly when alternating between the dark of the road outside and the luminosity of the dashboard. 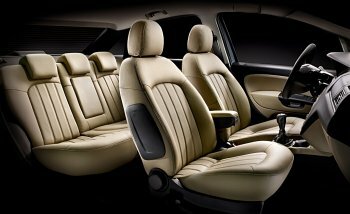 The front and rear seats of the Fiat Linea merit a special mention. They were designed to guarantee the best level of comfort for every passenger percentile, by close collaboration with the best ergonomic and sport medicine specialists. To start with, to enhance comfort, and above all the absorption of vibration, the front seats feature a new lumbar support system which sustains the back better (electric controls are available on request for the driver’s seat). The front seats are padded with foam that adapts to the shape of the body, and incorporate an anti-submarining structure which prevents the body from sliding forward, under the seat-belt, in a violent frontal impact. The front seats offer the following adjustments: height, longitudinal, squab inclination and lumbar (with an electric control). The head-restraints incorporate a device that adjusts the height and they can be fitted, on request, with an anti-whiplash system (which brings the head-restraint closer to the occupant’s neck in the event of an impact). And finally, there is the option of heated front seats. The rear seat is homologated for three passengers, and comes with a fixed or 40/60 split squab depending on the version. They also incorporate an anti-submarining structure and padding with differentiated support depending on the part of the seat occupied (it is a parameter that measures the compression of the padding under the weight of the body). The rear seats are also fitted with Isofix attachments for child seats, and head-restraints are standard equipment on the side seats (the head-restraint for the centre seat is optional). The three rear head-restraints (the third is standard depending on the outfit and market) adjust for height.